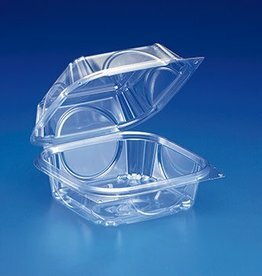 Hinged Container, 6" Clear Container 4/125ct. Case. The crystal clear design provides optimal product visibility, making your food instantly identifiable. It also expertly showcases the vibrant colors of small salads, snacks, or desserts.